The classic "Degenatron" design altered to compensate for a second player. This design allows for a up to a 23" widescreen monitor, and the extra width allows for 2 player head to head action. I have built 2 of these kits from Haruman’s Customs. The materials, router cuts and design are of the highest quality. Shipment was meticulous with padding and protection on each piece. The result is a perfect cabinet that all my friends are envious of. Well Done! This is a great bartop kit at a great price! 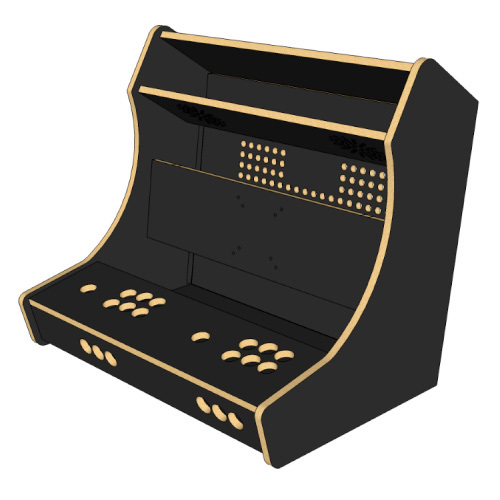 As sturdy as a real arcade machines unlike the Arcade 1up cabinet a buddy has. Thinking about getting the cocktail table. It uses wood glue and will not come apart after putting together. Make sure you don't get the speaker piece glued in upside down like I did. The holes are cleaner on one side. Well packed with pipe insulation around the edges to prevent damage. If you get this kit, buy the t-molding with it. It cost more than $10 anywhere else. I reused the pipe insulation to insulate some pipes under the house afterwards.